Our last ‘big’ trip we took before moving from Germany was a trip to Rome at the end of March 2006. We had 5 days to see thousands of years of history. It’s not called the “Eternal City” for nothing. 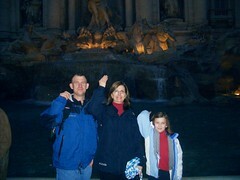 Our first stop after getting to the hotel and meeting up with our good friend, Heidi, was to go to Trevi Fountain. It was so good to see Heidi and I was thrilled she’d be spending a few days touring around with us. I still think we would make a good “Amazing Race” team. Heidi was the one who found the Bed and Breakfast we stayed at and the Daphne Inn was a great choice. The staff was excellent and it was in a fabulous location. I highly recommend it should you find yourself in Rome. During our stay, we did our best to see as much of the city as we could. The best thing we did was opt for a ‘private’ tour of the Vatican. Basically, it got us into the Sistine Chapel prior to the hoards of tour buses arrived. It was pure joy to be in the Sistine Chapel with all but 10 people. I was so in awe that I have NO photos of our tour of the Vatican. Our tour guide, Luana, was such a wealth of information and it was all we could do to keep up with her. After the Sistine Chapel, we toured the Vatican Museum. I was completely overwhelmed. After the morning tour of the Vatican, we toured Rome with a guide/driver named Ugo. I was very impressed with his ability to park in the tiniest of parking spots 😉 He took us to the Pantheon, the Colosseum, Tomb of the Unknown Soldier and the St. Peter in Chains church. 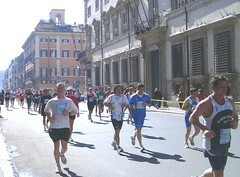 On our last day in Rome, FM ran the marathon. Since the roads around Rome were closed for the marathon, FG and I wandered the streets with very little traffic. This particular marathon allowed us to track FM’s run byt using runners at certain intervals. They had runners with balloons who were running a 3 hour marathon, 3 hours 15 minutes and so on. Since we knew FM runs about a 4 hour marathon, we waited for the person with the 4 hour balloons and, low and behold, FM was not far behind. It was a wonderful way to end our travels around Europe. Now we know where we want to return to and Rome is definitely on the return list. Beth: OK, now I’m being REALLY selfish and crossing my fingers AND toes hoping both you and Nicole end up at Drum. Could be fun! We never made it to Rome and I still can’t believe it. I’ll write down your suggestions for our next European tour. Good luck at Drum! D. has actually suggested it for our next place, and I just look at him like he has two heads. Or like he lost the one he has. You can see Niagara Falls at least!